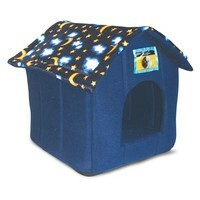 Ancol Just 4 Pets House Bed - Moon & Stars. A cozy little hideaway for your cat, small dog or even your rabbit. Featuring a stunning moon & stars design on the roof, and made from 90% deep blue cotton, this Ancol House Bed has been created with your pets comfort in mind. With a separate, removable cushion and completely padded sides, base and roof, there is also a small protected window above the entrance that you can place a photo or the name of your pet to give it a personal touch. The whole bed is machine washable and the roof can be easily detached via easy to use velcro fastenings.